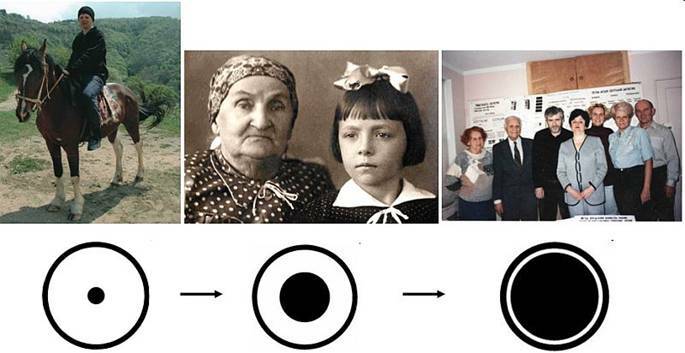 We are Victoria Popova Dr.Sc., Ph.D. and Lidia Andrianova Ph.D. – two women-scientists from Russia. During 15 years through сhanneling we received information and two keys analog and digital for decoding of extraterrestrial civilizations (ETC) pictograms. We decoded thousands of ETC pictograms scattered all over the world and composed ETC’ Dictionary of Symbols of Consciousness for over 300 symbols. Now everyone can read and understand messages of ETC. ETC are long ago on Earth. During many millennia ETC created around the world many objects-pictograms with the same symbolic and the identical information technology unknown to humanity. These objects form the System of Information Transmission (SIT) which covered the whole world. All ETC pictograms are classified into two groups of information: acquaint and emergency. Objects with acquaint information ETC created in stone in order to save for long time, sometimes for millennia. Among objects with ETC acquaint information are: Stonehenge, Muchu Picchu, Chichen-Itza, Chavin de Huantar, Chachapoyas, Cuzco, the Nazca Lines, the great pyramids of Giza and the Sphynx, moai of Easter Island, Mexican pyramids the Moon and the Sun and many others. ETC transfer information about the program of humanity consciousness development on Earth, in solar system and in universe. The emergency information ETC transfer through crop circles. The purpose of ETC is to warn humanity about the beginning of global cataclysms and three preliminary cataclysms shortly before them and to give humanity instructions for continuation of life. Summary. Five-pointed star shows mankind the ultimate goal of our life on Earth – unification of consciousness. The pictogram informs about the necessity of immediate unification of consciousness for humanity Transition into the next cycle of life before the global cataclysms beginning. For the Transition on the other parallel level of the material world is necessary to make a body transformation. For this purpose, the united consciousness of civilization has to cause a laser beam that removes the body from the level of global cataclysms. The laser beam can arise only in homogeneous resonant medium of the unified consciousness of humanity. The pictogram is decoded in terms of extraterrestrials symbolic of consciousness presented in composed by us «Dictionary of extraterrestrials symbols of consciousness». Decoding of the pictogram is made regardless of whether it is made by extraterrestrials or people, i.e. hoax. Five-pointed star – the symbol of humanity united consciousness. 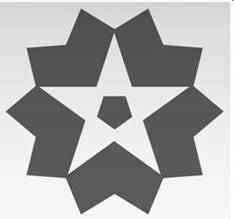 The main element of the pictogram is a five-pointed star. It represents the fifth level of consciousness – the united consciousness of humanity. The unification of consciousness – is the ultimate goal of improvement of humanity consciousness on Earth. Extraterrestrial civilizations inform that the universe is a uniform system of consciousness perfection. In the universe are developed five levels of consciousness. • The first level is consciousness of stars. • The second level – consciousness of inorganic nature of planets. • The third level – consciousness of organic nature of planets. • The fourth level – consciousness of mankind. • The fifth level – the united consciousness of humanity. This is the highest level because the united consciousness of humanity possesses an action. The action arises when people unite consciousness with a common goal. That is why there are collective prayers and collective meditations. Whenever people unite consciousness – arises an action. However, if consciousness of humanity has low level, this effect is very weak – often unnoticeable. Extraterrestrials have very high level of consciousness and use an action of the united consciousness in all life problems. The action of the united consciousness for teleportation flights through the universe. This action, for example, is the basis for body transformation for extraterrestrials teleportation flights through the universe. ETC unite consciousness with a common goal – the body transformation for a flight to the desired location in the universe. The body becomes holographic. This means that they automatically switched to the selected sub-level of the Intermediate level of the material world through which they immediately transfer to a specified location of the universe, where they materialize. The united consciousness action in information technologies. The action of the united consciousness is the basis of all information technology of extraterrestrial civilizations. ETC unite consciousness with the specified object, which, for example, has to be raised up on a given height, and put in a specified place. At the same time according to the goal gravity of this object is changed, a block rises off the ground, and begins to move smoothly through the air in a given direction. If necessary to move objects on long-distances ETC use its teleportation. 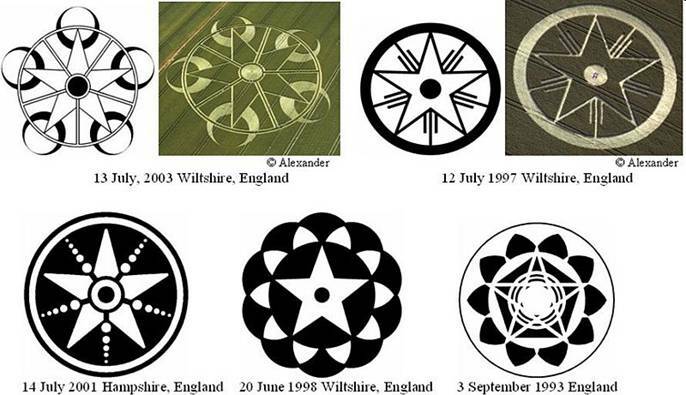 The action of the united consciousness for crop circles creating. 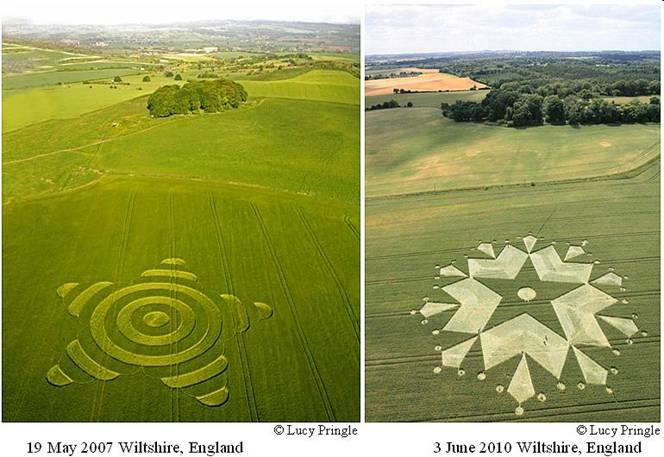 The extraterrestrials united consciousness action bent stems of plants and, thus, create crop circles – the pictograms with emergency information. Crop circles transmit urgent information about critical state of Earth magnetic field and also the Instructions for the Transition. The united consciousness action for salvation of Earth civilization life. This unknown to mankind magical ability of the united consciousness to cause an action has to save Earth civilization from destruction in global cataclysms. Extraterrestrial civilizations Instructions explain humanity how easy is to make the Transition through the action of the united consciousness. The Transition is the only possibility to escape from global cataclysms which will begin shortly. 2012 is the year of global cataclysms beginning and humanity Transition into a new cycle of life. Recently, the pictograms on fields transmit very agitated information of extraterrestrial civilizations, because in 2012 on our planet will begin global cataclysms. This is due to the critical weakening of Earth magnetic field. 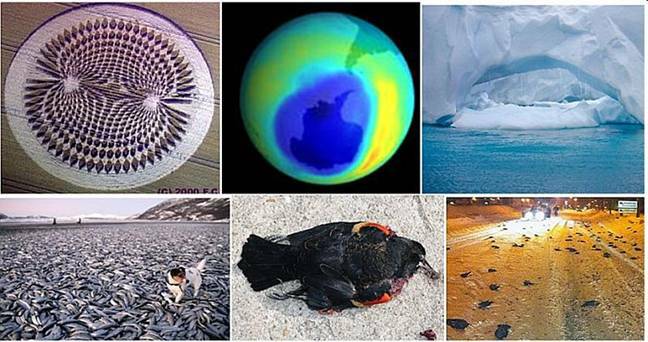 The weakening appears in increase of ozone holes and shift of the poles, splitting and melting of ice shelves, the death of numerous herds of whales, dolphins, fish, deaths of many thousands flocks of birds and other events. The purpose of starting natural blows is the complete destruction of our planet. Extraterrestrials gave the Instructions to mankind of Earth – how to save lives. The Instructions tell us that before the global cataclysms beginning humanity has to make the Transition on another safe level of the material world, where there are no disasters. If humanity will not make the Transition in time – before the second pre-cataclysm 22 September 2012, global cataclysms will destroy civilization because the purpose of beginning natural blows – the complete destruction of the planet. The universe is a unified system of consciousness so, all planets in harmony of which consciousness had already completed its perfection, has to be destroyed. Consciousness of mankind has already reached its highest level. So, we have to make the Transition to the next cycle of life and our planet has to be destroyed. The ETCs Instructions for the Transition of Earth’ mankind in the next cycle of life. Extraterrestrial civilizations inform that it is very easy to make the Transition – we only have to make our body transformation. How? It turns out that the body can be transformed only through the action of the united consciousness. Our body listens only the commands of consciousness’ action. In order to make the Transition in the chosen day and time it is necessary to unite consciousness all civilization of Earth with a common goal – to destroy our body at the level of global cataclysms, where we live now. Our consciousness is still very imperfect and capable of causing only a weak action. Therefore, we have to be trained to unite consciousness in the separate groups, and then by country and by continents. When we learn to unite consciousness easy, then we have to train for the unification of the consciousness of all civilization. Our goal is to cause the laser beam that destroys the body at the level of Crystal Structures, where we now live. 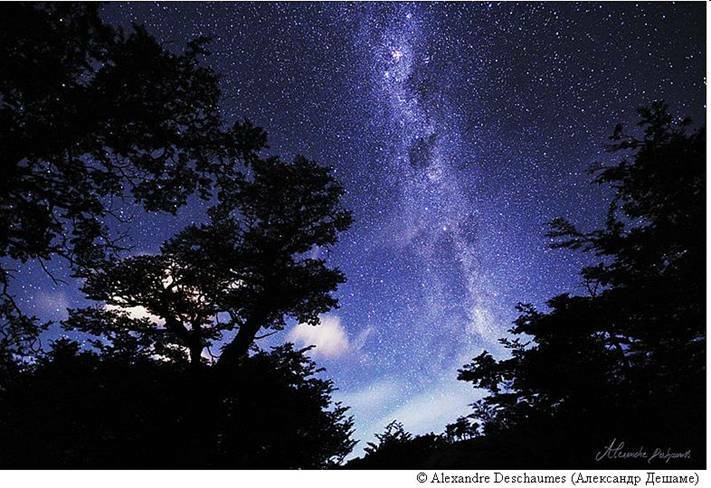 At the same time, renewed humanity will re-appear at the Highest level of the material world. So, the General resurrection of Earth mankind will happen and new cycle of life – the cycle of Corrections will begin. Extraterrestrial civilizations inform that the laser beam occurs only in homogeneous resonance medium of humanity united consciousness. For this purpose each of us has to open his soul to love and mutual understanding. The communication between people has to be based on the principle – Love thy neighbor as thyself! The pictogram transmits information about the necessity to unite consciousness of Earth mankind. 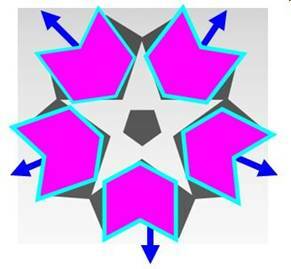 The central part of the pictogram is a five-pointed star, in which center is placed the pentagon. Individual cell of human being is formed by a ring that unites the tops of the star rays and the small circle in the center (Fig. 1). On the other hand, the pictogram shows expansion of brain areas of individual cells – colored in green – as a result of uniting consciousness of growing number of people (Fig. 2). Individual cell is a presentation of a human being in the Information world. We have repeatedly told that the individual cell is a representation of a human being at the information level of the Universe. Expansion of a brain area occurs only when two or more people unite consciousness. Here's how it looks in the ETC’ symbols of consciousness. So, the expansion of a brain area of individual cell, shown in Fig. 2, means unification of consciousness of more and more people. Every two rays of the star are connected by the figure reminding an arrow (Fig. 3), which is composed of two quadrangles (Fig. 4). 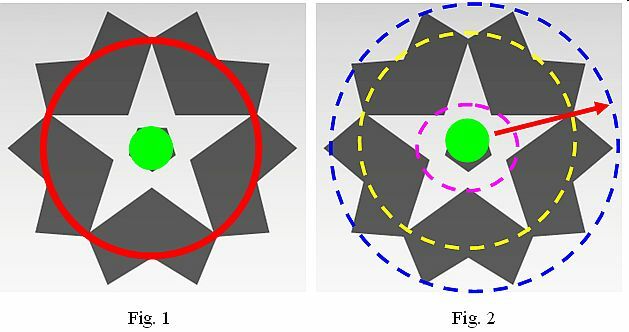 Quadrangles represent the fourth level of consciousness – a human being. So, each of two joined together quadrangles represents the individual cell of human being and joined together quadrangles represent the unification of consciousness of two people. Expansion of cell’ brain area points at unification of consciousness of increasing number of people. From another point of view, every two quadrangles, which form an arrow, inform about the unification of consciousness. The shape of an arrow represents expansion of the brain area that accompanies this process (Fig. 5). Thus, the pictogram indicates the expansion of cells’ brain area at consciousness unification. It means that Earth's humanity has to unite consciousness for the Transition and continuation of life. 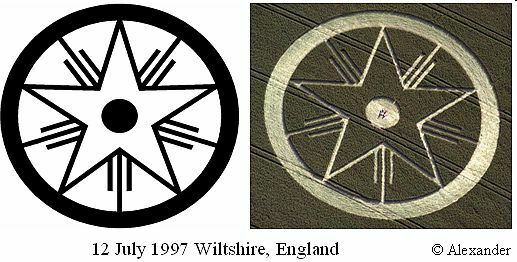 Crop circles depicting five-pointed stars and pentagons appear frequently on fields of England. All people of Earth have one destiny – the Transition to the safe level of the material world or destruction in global cataclysms. Only 5 steps and the Transition for continuation of life! • Synchronization of consciousness of whole civilization. Руководство Правительств мира – это самое главное условие победы Перехода. The technique of synchronization of humanity’ united consciousness is similar to meditation with common goal – to cause a laser beam for body destruction on the level of global cataclysms and the Transition to the Highest level of the material world. The technique of the Sudarshan Kriya is based on the four forms of breathing: Ujjayi, «victorious breath»; Bhastrika, «bellows breath»; the chant of «OM»; and Kriya, «purifying breath». The practice of the yoga breathing is studded by scientists of famous Medical Schools, such as Columbia University, the New York Medical College, the Harvard Medical School and others. They confirm that Kriya techniques can effectively address symptoms of anxiety and depression. ETC confirm, that in order to cause an action in the form of the laser beam the medium of humanity’ united consciousness сell has to be resonant and homogeneous. The effect of resonance clearly demonstrates a well-known example. A company of soldiers, crossing the bridge by marching step, aroused so strong resonance that the bridge collapsed. After that incident, at passing the bridge the soldiers were forbidden to go in marching step, and ordered to go piecemeal, because in this case the resonance does not occur. By analogy, the laser beam can cause only complete resonance of the synchronous unification of humanity’ consciousness associated with the common goal and consequently forming homogeneous medium. Demonstration the power of the laser beam for the Transition. Extraterrestrial civilizations show the power of the laser beam necessary for the Transition with a beam of light when the sun reaches zenith in the Mexican complex Xochicalca. Usually, the beam of sunlight through a hole in the ceiling is very weak and almost is not visible. The civilization active, i.e. people, whose consciousness causes an action, makes only a part of mankind. The united consciousness of many people does not cause an action. Consciousness not of all people has identical action – it can be strong, medium and weak. The majority of humanity – with an average and weak action of the united consciousness – has to create resonant homogeneous medium, which will multiply increase the power of caused laser beams, which will cover the entire united cell of Earth civilization. On the planet there are many mentally disabled people, whose consciousness does not have action also. There are other categories of people whose consciousness has very weak action or no action at all. Today, everyone is counted. It is necessary to stop suicide. After the second pre-cataclysm on September 22, 2012 and before the beginning of global cataclysms on December 21, 2012 it will be almost impossible to make the Transition. At this very short time interval – 3 months – probably, will be strong radioactive contamination of environment due to destruction of many nuclear stations located on the way of the second pre-cataclysm blow. Communications systems will be broken. Mourning and shock as a result of huge losses – our friends and relatives will paralyze people’ consciousness. We have very narrow corridor of time before September 22, the second pre-cataclysm! ETC will not allow the poles overturn, because otherwise humanity will be immediately destroyed. So, every day is counted before the second pre-cataclysm. We have to begin training for the unification of consciousness for the Transition as soon as possible. We have to complete the training and to make the Transition before the September 18, 2012, because may occur some unforeseen difficulties due to changes of our planet and its preparation to super-powerful natural phenomena – the second pre-cataclysm. This could be sharp throws of critically decreasing magnetic field which will cause big jumps of atmospheric pressure etc. Five-pointed star shows mankind the ultimate goal of our life on Earth – unification of consciousness. The pictogram informs about the necessity of immediate unification of consciousness for the Transition into the next cycle of life before the global cataclysms beginning. The Transition has to be made before September 22, 2012 due to the occurrence of the second pre-cataclysm. For the Transition to the other parallel level of the material world is necessary to transform our body. For this purpose, the united consciousness of civilization has to cause a laser beam that removes the body from the level of global cataclysms. The laser beam can only arise in uniform resonant medium of the united consciousness of humanity. Thus, before the second pre-cataclysm September 22, 2012, we have very short time for training. Only now – till September 22, 2012 – our civilization can make the Transition without complications. After it, probably, will be strong radioactive contamination of environment due to destruction of many nuclear stations located on the way of the second pre-cataclysm blow. Communications systems will be broken. The Transition time already clocks, but we do not act. What are we waiting for? Nuclear attack of global cataclysms beginning? Mankind inactivity is criminal! Extraterrestrial civilization would not allow overturning of the poles, because otherwise humanity will be destroyed immediately. So, mankind has to make the Transition through the unification of consciousness under the leadership and active participation of the governments around the world. 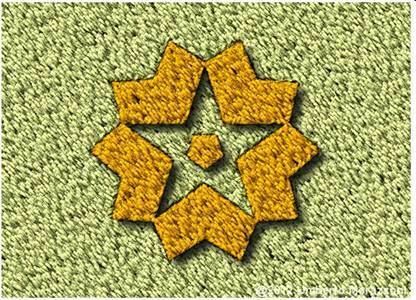 Five-pointed stars frequently appear in the fields. They point on the ultimate goal of humanity staying on Earth in the cycle of Consciousness – the unification of individual consciousness. The decision about unification represents the highest degree of consciousness, achieved in harmony of the planet at this level. However, the decision about unification is incredibly difficult for individual consciousness. That's why all the planets where humanity develops with low level of consciousness, similar to ours, contain phase of global cataclysms beginning. At the time of achieving the highest level of consciousness in the harmony of the planet where they live, under fear of complete destruction by global cataclysms the civilization is forced to unite consciousness for the Transition. This Transition in the cycle of Corrections is necessary for forced consciousness correction in accordance with the laws of the Universe. Thus, today, the Earth's civilization is facing critical decision that will manifest the achieved consciousness perfection. Today, our fate is solved. The civilization of Earth will continue its life and development, if followed by a warning of extraterrestrial civilizations of higher consciousness about the beginning of global cataclysms and the necessity to make the Transition by unification of consciousness. If consciousness of Earth's civilization will not be able to break free from the chains of the material world – a world of private property, money, power of imaginary personalities, etc., it will be completely destroyed by global catastrophes. It does not matter who did not want to make the decision – the world's governments or people of the Earth. Earth civilization is common by its basis – it is one cell of humanity on the planet. Therefore, we should act as a single organism. Everybody has to make the decision – each individual and every one of us should carry out this decision in life. No need to point to the other, noting their unwillingness. Everyone is a unit of civilization. Today, the destiny of each of us is solved – all of us either continue life or very quickly will be destroyed by natural blows of incredible strength. We should make the Transition before September 18, 2012. Why? The answer to this question is presented in our complete article and also in the decoded pictogram on fields on April 28, 2012 Wiltshire, England.